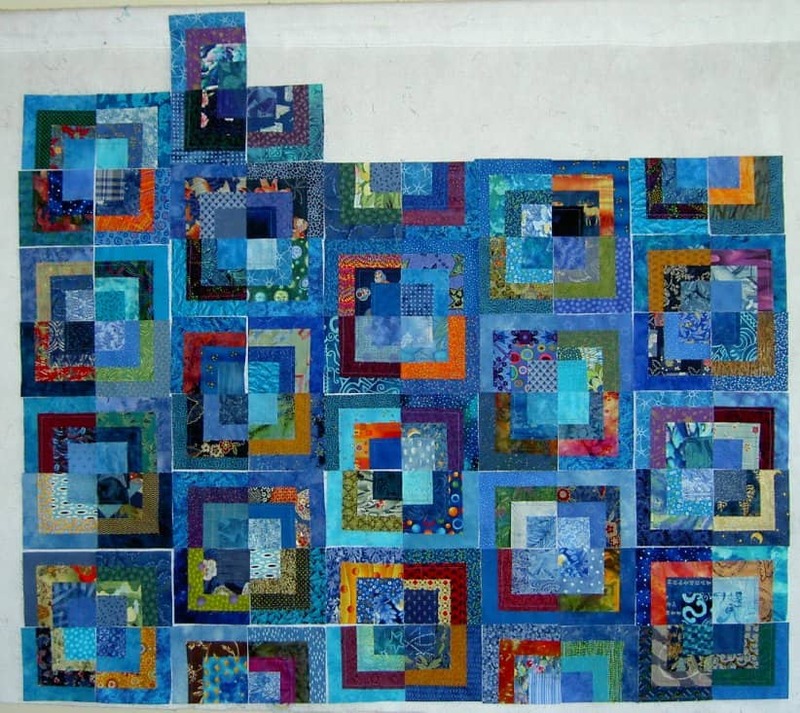 All of the blocks for Feelin’ Blue, Too are sewn to another block, except for the corners. For the most part, I have half blocks now. I did sew one whole block together as a test. It looks great and I am thrilled with the way this quilt is coming out. I love the process and to see the way the quilt evolves each step of the way. I did find, however, that I need to repress all of the half blocks so the seam allowance is going in the other direction. This will allow me to more easily make the middle seams match up. I know it seems like a small thing and who cares, really, in an art quilt? I care. I want the centers to match and I want to not be embarrassed when I look at it. If all of the blocks aren’t perfect, OK, but I want it to be done right and to have tried my best. Some people don’t care about technique, especially in art quilts, but I think technique is important. It is important to try and do construction techniques my right way. Because of this, I am kind of being a hard nose on my students, but at least they will have learned my right way. After that, if they choose to do things another way, that is fine. At least they won’t be doing the other technique out of ignorance. I am amazed at how fast the rows went together. I had about a row done already, but sewed 5 rows total. Each row has 4 or 6 blocks in it. I am thriiled that I am making progress. This link will probably die at some point, but in the meantime, I am glad I found it. The site itself is clean and easy to view art at. Michael Adamson is a Toronto artist. I saw an article in the paper about him, which included a photos of his painting Elephant Walk, which I love. It is happy in a sophisticated sort of way (not a Hello Kitty sort of way). The man looks like he knows how to paint and has a method rather than just slapping paint onto a canvas, because he didn’t want to get a job. Well, I did it and came out of the blog closet to the Mavs. It is cool, actually, because a few people have commented. Now I feel pressure! I had better sew something tonight! The quilt class is off for tomorrow, so I am off the hook for that preparation, but I would be smart to get my act together early rather than waiting until the last minute. I did pick out other blocks and make some of the handouts, so that is something. I also got some help on the basket block from EQ Tech Support. Penny responded, so I felt really special! I have to look at what she did and see if it will work. Of course, I could finish the Drunkard’s Path and Grandmother’s Flower Garden blocks as examples. I feel a little lame for not having done those blocks yet. I want to sew some more of Feelin’ Blue, Too (new name after talking to JZS and Aja) together as JZS and Aja are way ahead of me in putting the quilt together. We’ll see. I may just rest. 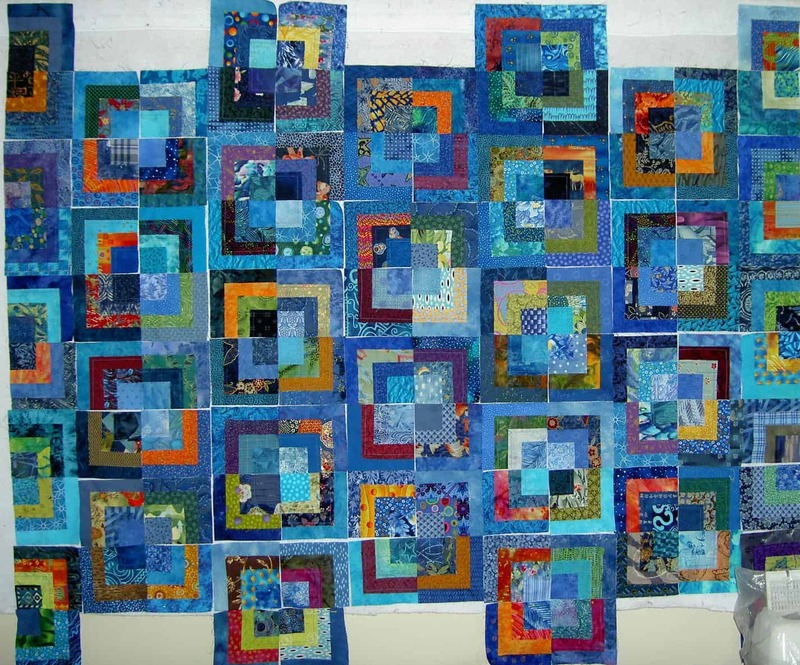 I realized today that the deadline for the Marin show is fast approaching and I had better get the form filled out for this quilt, call the quilter, etc. I have sewn some of it, but not much. I planned to do little bits this week while W was gone, but haven’t made it so far. I also need to make the templates and cut pieces for the 8 pointed star. 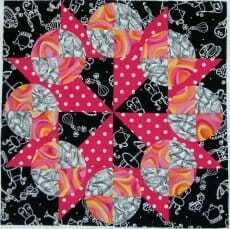 My quilt class will be doing the 8 pointed star this week and I want to be able to show them how to do the joins. I need to take a look at Judy Martin’s Ultimate Rotary Cutting Reference Book to see how to use the Point Trimmer to make the diamonds easier to put together. I had a little trouble using the tool on my blocks for the Teacher Pillows, but perhaps I was in a rush? As I was walking around Toronto a few days ago, I saw this sculpture in the Galerie Christin on Yonge Street. The horse really has a great movement (or shape, maybe??). I love the curve that the artist has captured. I think the horse looks like it will walk away. The pieces look like they are made from found objects. I think that there are some sculptures made from found pieces that are really well done. The face of the mannequin looks a little eerie becuase of the size of the eyes, but there is so much more to look at that you can forget about the eyes. Aja’s blocks for Feelin’ Blue arrived this week and they are gorgeous. I think she must have picked backgrounds, which truly inspired JZS and I to do our best. 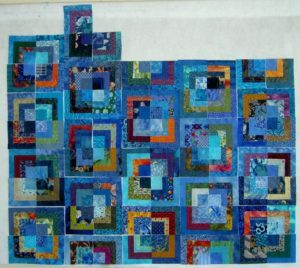 All of the blocks are gorgeous and together they have the right amount of color with right amount of blue. It is still monochromatic, but not boring. 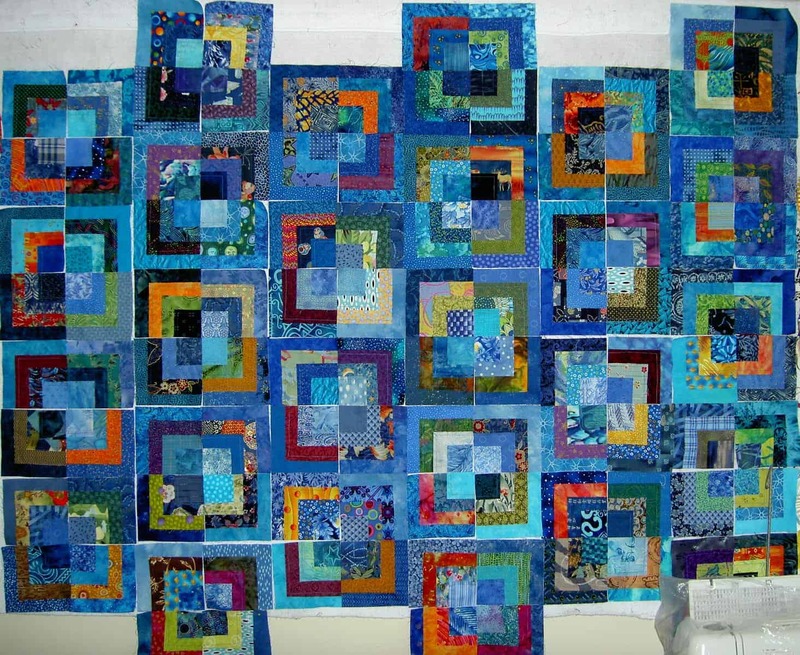 I read or took a class somewhere/sometime and recall the teacher/author saying that you had to add a little of the complementary color to a monochromatic quilt to make it interesting. I’ll have to look up from where I am remembering that comment. Now my task is to layout the blocks.I have a couple of different ideas. The first one is nice, but unbalanced. Balance isn’t always what it is cracked up to be, but I do like balance. The second photo is my attempt at balance. I am leaning on going with this option. I still may play around with the layout some more just to see what I can come up with. I am also still fiddling with the placement of the individual pieces. I stare at it in the morning for 45 minutes or so and move pieces around based on different subjective criteria. Two light blues in the middle piece are next to each other and thus make a big light blue blob. Too many oranges in one area. Etc. Several years ago I bought a book from the Central Oklahoma Quilters Guild. It is volume three of a multi-volume set of Kansas City Star blocks. I looked through it recently and was reminded that the blocks make me drool with possibilities. Of course, the blocks would have to be redrafted for piecing. 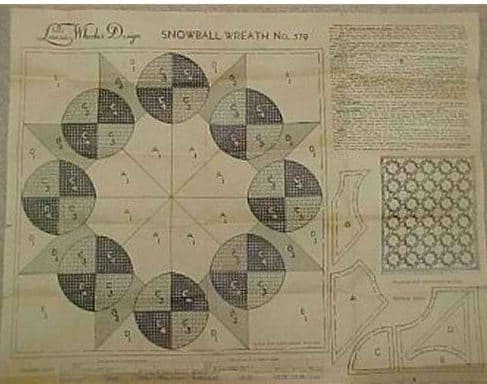 I have to say that the women who made some of the blocks when the blocks were first published were no sewing wimps. Many of the blocks have inset seams, irregular shapes, very thin triangles, etc. In that vein, I began thinking about the newspaper clipping of a Laura Wheeler block (newspaper clipping) and tried to remake it. I didn’t use the templates given in the newspaper clipping, because I only had a picture of the newspaper clipping and not the original clipping. Also, the shapes of the pieces were crazy – at least for my level of skill in piecing! I am pleased with the way my block came out, even though I used different techniques (piecing combined with applique’ than the original block. I would like to try again different ways, using different fabrics. I don’t think I got the spacing quite right. There is something not quite right about the newspaper clipping when compared with the actual fabric sample I made. 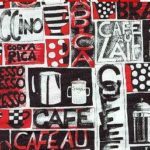 I don’t think it is an easy task to look at a picture of a newspaper clipping and then create it in fabric, but it was a puzzle that I couldn’t put away. I feel the same way about some of the Kansas City Star blocks. It would be a great project to try and remake them all. What a lot of blocks that would be. Some of them would be fine, but some would be quite challenging. I was sitting at my computer working when I looked up and saw the sunset out my window. 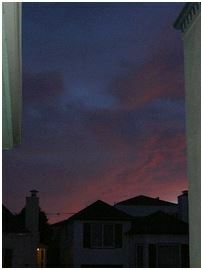 The digital couldn’t deal with the screens on the window so this photo is taken from my front porch. You get a great view of my neighbor’s house! I love the colors. They make me want to sew. I am not sure what to sew, but I want to sew. I have been thinking about making two ATCs as thank you gifts, but can’t quite seem to get started. I thought of using some hand-dyed rickrack that I have that I used on the quilt What Comes Next. We’ll see. I am not sure what else I would do or how to start, so I guess it requires more thinking. I had hoped to receive Aja’s bullseyes for Feelin’ Blue today, but they didn’t arrive. Perhaps tomorrow. Another project off the ‘to do’ list! I finished some napkins today that have been hanging around for several months. I bought the fabric in August 2004 at APNQ with JCN. I washed, cut up the fabric and did the first round of stitching. I even did the miserable part, which is turning the napkins inside out and carefully pressing them. I like two sided napkins as I can use more fabric and they don’t have to be washed as soon. Then they just hung around waiting for me to do the topstitching. I topstitched around one a few weeks ago, but didn’t get to the last three until today. Now they are finished and I can move on. These are the fabrics I used. 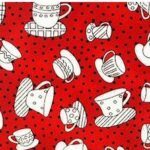 Author JayePosted on Sunday, May 15, 2005 Tuesday, June 26, 2018 Categories 2005Tags Off Topic: CraftsLeave a comment on Another project off the ‘to do’ list! I am working on the third in a series of bullseye quilts. All of them have been group projects and this is no exception. The most recent two, Seeing Red and Feelin’ Blue, have been made with two friends, JZS and Aja. Feelin’ Blue is quite monochromatic in feel and may work well in our bedroom. This is a photo of how it looks on the design wall without Aja’s quarter blocks. 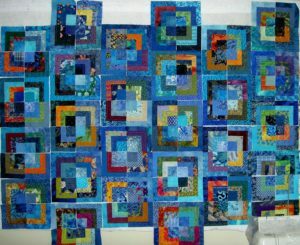 I have been working on a lot of quilts and haven’t had the time to update my website’s ‘in progress’ page to show them all. I thought starting a blog, which is linked to my site would be better. This blog is not yet linked, but it will be when I get all the kinks worked out. Thanks for reading. I live in Northern California and love quiltmaking. I am interested in good design and creativity. I hope to inspire others and create a continuing dialog with this blog. Thanks for reading!